"This experience was totally AWESOME and AMAZING! I mean, I can't name another place or time where I could meet kids that have a crazy passion for cooking and can cook--just like I do!!!" Watch it and you'll understand what I mean! 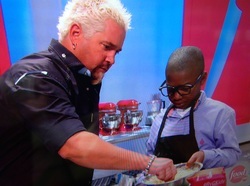 Big shout out to Guy Fieri who showed so much patience with me and showed me knife skills, plating techniques, presentation skills and pride...WOW!!! Thanks to all my Cook-Off family who were just great to be around. I recommend this experience to all young chefs and chefs-to-be! As the only Canadian on the show it was a great pleasure to be around kids from America that share the same passion for cooking as I do! When my mom and I first got to the hotel my bed was filled with lots of stuff from the Food Network, Rachael and Guy! We got stuffed animals-(Cloudy with a Chance of Meatballs "Berry"), Cloudy with a Chance of Meatballs 2 dvd, book, and video game. We got a little Food Network bear wearing a cooking apron, and water bottle--Rachael Ray gave us really cool orange utensils, a huge orange thermal bag, and her signature orange coloured oil and vinegar fancy containers and more--From Guy Fieri, he gave us his signature frying pan with really cool baby blue "Ed Hardy"--type wings at the bottom (too cool 2 use--you can see it on my Quiteabite YouTube videos if you're clever), a cool cutting board with a picture of the cuts of a pig (too cool to use)--We each got a camera that we took tons of pictures with the celebrity chefs (so cool to meet them) and Hollywood celebrities! We all met Stephanie Scott from the A.N.T. Farm (are you kidding me--and she loved my Super Fruit Crumble), Marion Ross from "Happy Days" (my mom was excited to see her) It was so much fun! Before the competition began, we were divided into two teams. I was immediately chosen for Guy's team! They gave us our own personalized chef jacket, and a binder to put our recipes in. On my team was Alessandra, Cole, and Sydney. We were given individual dishes that we had to cook within a limited time. They evaluated us on taste, oral presentation, creativity, and food presentation (plating). They totalled up the scores at the end of each competition. By the end of the show both teams were tied. Guy Fieri is as funny in real life as he is on Diners Drive-In's and Dives! and he is such an awesome teacher! He taught me my knife skills, presentation skills, mise en place (and was very patient with me). He was sooooo awesome! He also sent me a really cool post card thanking me for my time! WOW!!!!!!! He is the coolest. I was so inspired by him. Guy, I hope you will always remember me! Meeting Rachael was just awesome! She was always smiling and seemed to really enjoy working with kids much like Guy. With Rachael, it's what you see is what you get. I can tell she was a huge inspiration to her team and I learned a few tricks from her as well. Thanks Rachael, I hope you remember me too!